Power companies provide electricity to customers using AC power. AC stands for alternating current. The power oscillates at a consistent rate or frequency in an AC system. Electrical power in North America is generated with a frequency of 60 cycles per second or 60 hertz. This is referred to as the fundamental frequency. Europe uses a 50-hertz power system. "Dirty Electricity" refers to electrical distortion that is present beyond the fundamental frequency. Dirty electricity is commonly referred to as noise or electromagnetic interference by Electrical Engineers. In the context of environmental health, it refers to elevated electrical pollution on wiring that can cause health effects. 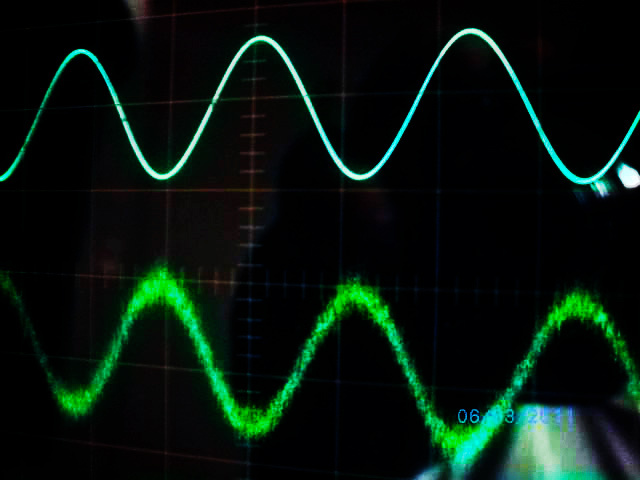 An oscilloscope is a tool that allows you to view what the electricity looks in a graph called a waveform. The image below contains a waveform of clean electricity (top) and dirty electricity (bottom). The waveform of dirty electricity is more jagged and noisy as compared to the smooth waveform of clean electricity. Dirty electricity (bottom) compared to clean electricity (above). Many EMF professionals will define dirty electricity as high-frequency radiation that exists on electrical wiring, typically above two kilohertz. However, dirty electricity can also encompass anomolies like random voltage spikes. There are three main subcomponents to dirty electricity: transients, harmonics, and interference. A transient is a deviation to the electrical system that occurs for a period of time, such as a voltage spike caused by lightning. Harmonics are best thought of as 'feedback' occurring at multiples of the fundamental frequency. Harmonics are generated by certain electrical consumption devices like power supplies that convert electricity from alternating current to direct current. Interference consists of frequencies that originate from other electrical sources like radio waves traveling through the air. Dirty electricity can be measured with a meter. Measurements can be taken directly on the electrical wires or through the air. Dirty electricity, when measured on the electrical wires, is commonly reported as a measurement of voltage deviation and is commonly reported in millivolts (mV). Dirty electricity is a concern because the majority of electrical wires and power cords are unshielded. The dirty energy radiates off of these unshielded wires and into living spaces and can affect biological functions.